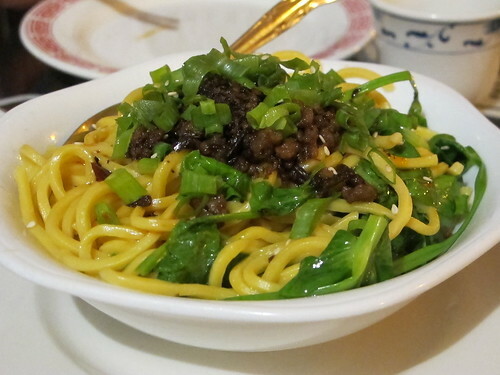 Even though I had just enjoyed a bit of fine Sichuan cuisine while I was in Boston, when Jennifer suggested trying a relatively new Sichuan restaurant in Atlanta, I was all for it. Situated just north of 285 in the former Chonq Qing Hot Pot location, Gu’s Bistro has been open since early 2011 and in that time, Yiquan Gu and his restaurant have garnered a fair amount of favorable reviews: Gene Lee with the AJC and The Blissful Glutton weighed in with their opinions while Food Near Snellville took part in a massive 27 person meal. Always eager to try something new with favorable reviews and the potential for spiciness, Jennifer and I made the trek down Buford Highway for a late lunch. Once seated, it was time to face the eternal question of where to start. Fortunate or unfortunate, Gu’s Bisto does not make that an easy take. The appetizer section alone has more than 20 choices with several items, specifically the ha ha green jelly, causing even more confusion. 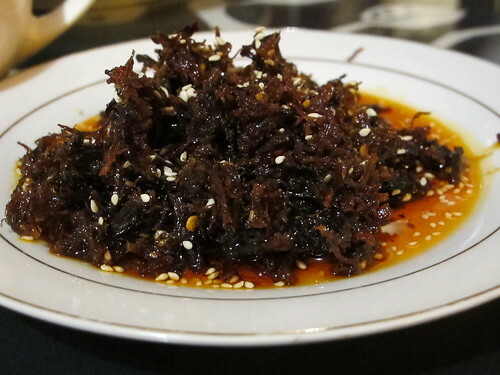 After several minutes of patience by our waiter, we placed an order for appetizers and soon the first dish arrived, crispy beef jerky with chili sauce. 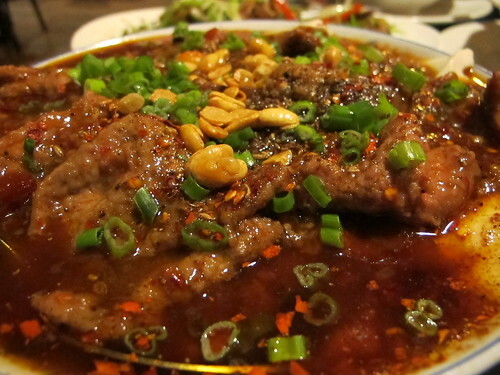 Who can turn down the idea of dried beef in a spicy sauce? 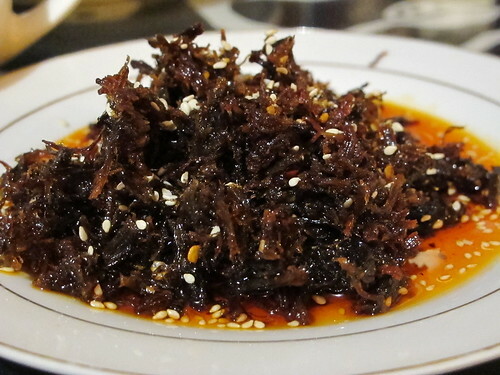 While the components, beef and chili oil, were familiar, the extra shredded texture was new. Shredded finely and dried fried until crunchy, this beef was oily with a lingering heat and nuttiness. Eaten plain or over rice, it was hard to stop grabbing another pinch of beef. Nigh impossible to resist, it was inevitable that an order of Dan Dan noodles would make it to the table. 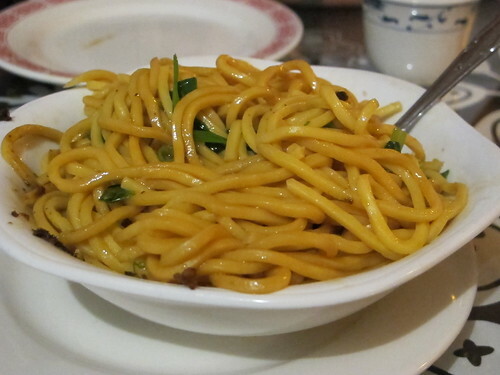 With big, thick, and chewy egg noodles, this was an interesting take on one of my favorite noodle dishes. 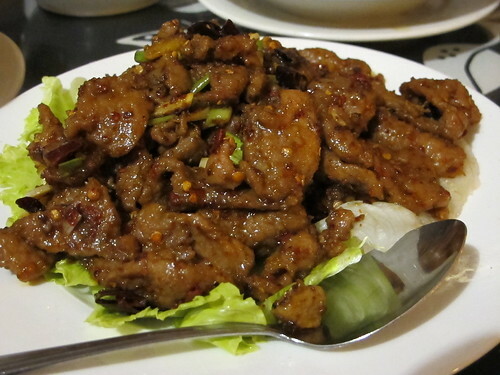 When mixed, the sparse amount of meat quickly disappeared, but the manageably spicy sauce soon dominated. There wasn’t an overwhelming sensation of ma la to this bowl, just pleasant noodles with enough heat to keep things interesting. Since the two of us can never get enough dumplings, an order of Chengdu wontons was the next item from the Szechuan Style Dim Sum section of the menu. 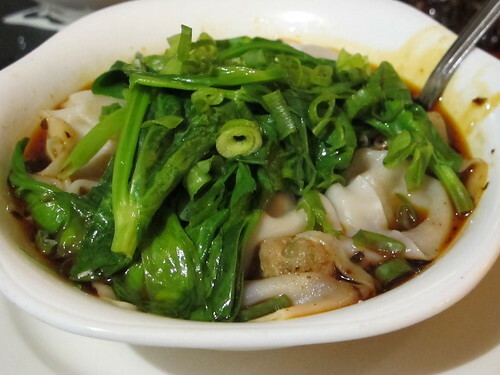 Somewhere beneath that greenery is a healthy dose of wontons, broth, and chili oil. Big flowing wings with a small ball of pork in the middle, these were classic, succulent wontons. 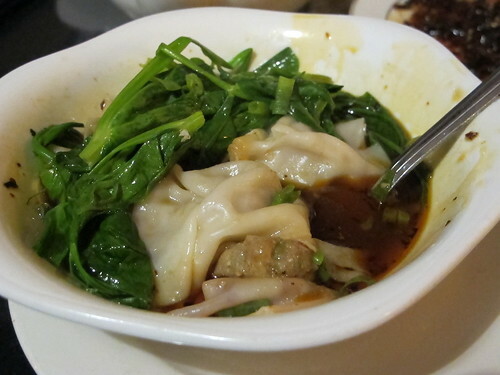 Accompanying the wontons was a sauce laced with plenty of chili oil, a satisfying touch of heat to accompany the pork and dough. 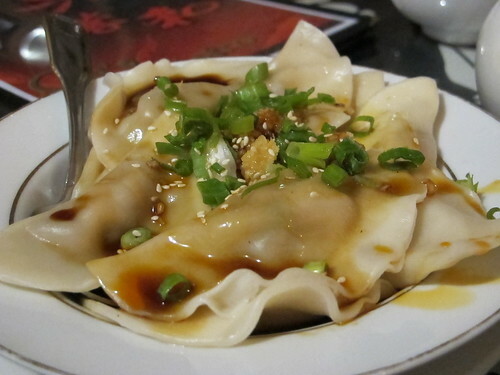 Knowing that two orders of dumplings is always better than one, the Zhong style dumplings were next to arrive. Simply folded and featuring likely the same filling as the Chengdu wontons, these dumplings had a sweet sauce that was lightly balanced with a smattering of chili oil. I didn’t taste the same bitterness as Zyman did in her encounter, but the Zhong style dumplings were a fine choice either way. Whenever a menu uses a system to denote spiciness, I can’t help but see it as a challenge. In the case of Gu’s Bistro, they use a system of one to four chilis to mark the spice level. With four being the highest, it was interesting that there were only three four chili dishes on the entire Chinese menu. Since I was still skeptical about the ha ha green jelly and wasn’t in the mood to pick at pork feet, the sautéed chicken with chili peppers was the only logical choice. 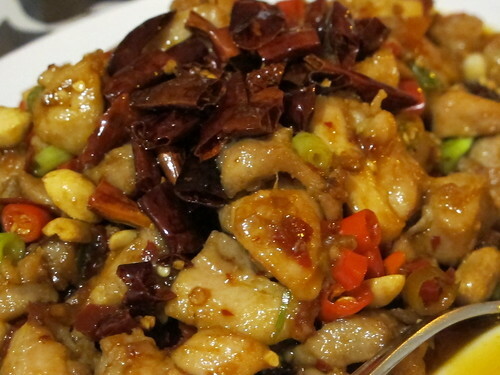 Topped with dried chilies, teeming with sliced, fresh chilies, and swimming in a pool of chili oil red sauce, I thought I might have gotten in over my head with this chicken. With the first bite, a definitive heat began building at the corners of my mouth but the full burning onslaught never really came. Instead, this was a plate of incredibly juicy, well-cooked chicken that was utterly delicious. Sure it was a little spicy, but it wasn’t overwhelming and the sweetness of the chicken had plenty of opportunity to shine through. 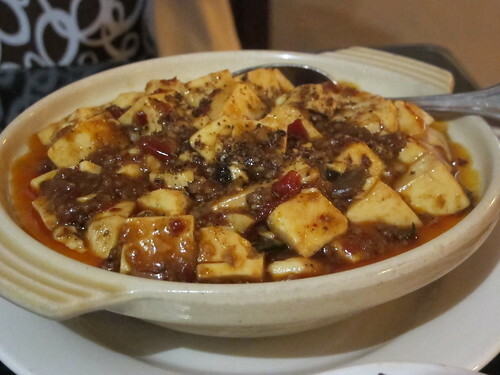 Looking to a Sichuan favorite, an order of ma po tofu began winding down the meal. Silky tofu in a vinegary sauce, there was the unmistakable dusty, citrus flavor and crunch of ground Sichuan peppercorns. Finishing up, cumin lamb was the last plate on the table. There was no shortage of tender lamb on this plate and each piece was teeming with the dusty flavor of cumin and a well-rounded heat. Texture wise, this lamb was fork tender and a little fatty but in a good way. Normally, this would have been the end of my review of Gu’s Bistro, but I was so far behind on writing that I actually had the opportunity to visit again. This time, we had Aaron in tow, so a few different dishes made an appearance. Besides a few repeat appearances by the Chengdu wontons and Dan Dan noodles, the appetizer that truly stuck out was the Ha Ha Green Jelly. Even after reassuring our waiter that we liked spicy food, he was hesitant to bring this dish to our table. 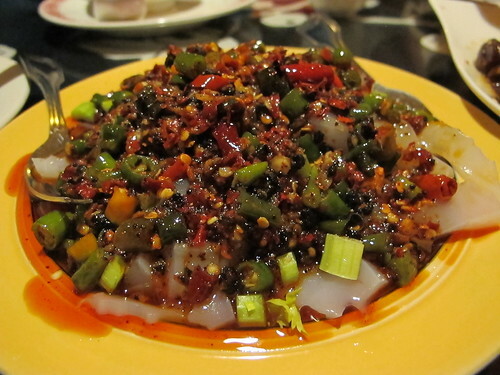 I’m still not quite sure how to describe the odd green jelly that was on the bottom of the bowl, but the rest was a goldmine of ma la and chilies. To put it mildly, I was infatuated with the chili mix and questioned the waiter why this wasn’t used on the Dan Dan noodles. The answer was something about different chilies for that dish, but I was too busy enjoying the jelly topping to really pay much attention. 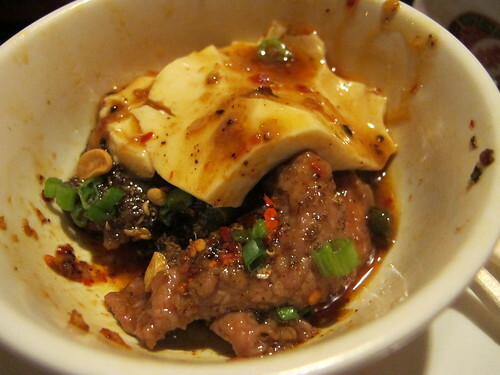 Dialing down the chili level to a simple 2 chili rating, we tried an order of the ma la beef with tofu. 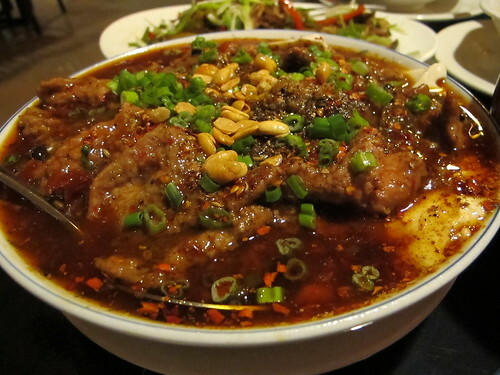 Topped with peanuts, plenty of ground Sichuan peppercorns, and sliced scallions, Gu’s Bistro again proved that they don’t skimp on the protein. As tender as the cumin lamb before, this beef was almost as silky and fork tender as the tofu. This dish was a beautiful combination of beef, tofu, chili oil, and Sichuan peppercorns, hard to stop eating and excellent over rice. The last dish was Aaron’s choice and something a little different, deboned tea smoked duck with scallions and ginger. 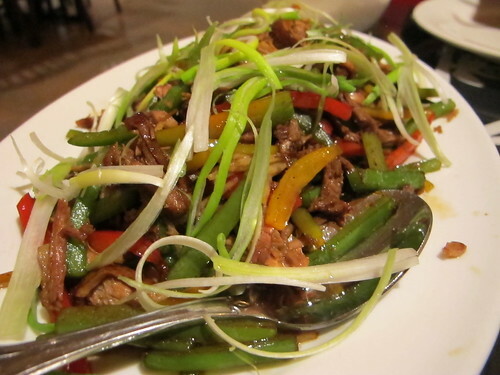 True to its name, this dish was full of scallions and ginger not to mention a bounty of sliced bell peppers and smoky duck. Yes, the duck was a little on the dry side, but the jasmine smoke flavor provided a smoky backdrop to every bite. Even though these two meals barely scratched the surface of Gu’s copious menu, nearly every dish made me wish I could visit Gu’s Bistro more often. However, I suppose that’s the least important part of this review. I imagine the main question is how does it stack up to the other Atlanta bastion of Sichuan cuisine, the infamous Peter Chang’s? As is the case with so many comparisons, each restaurant has its own strengths and weaknesses. 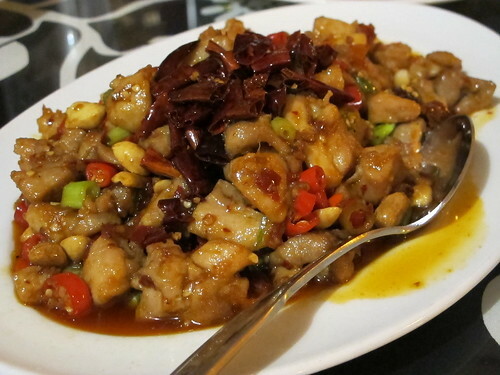 For sheer heat and ma la numbing, Gu’s Bistro couldn’t touch my first few times at Peter Chang’s, especially comparing Peter Chang’s Three Pepper Chicken to Gu’s sautéed chicken with chili peppers. If forced to choose between the two, I simply can’t. 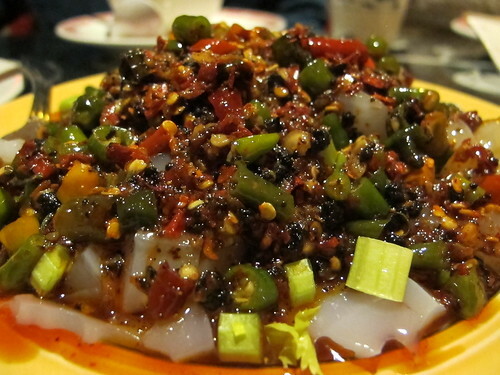 Isn’t it enough that Atlanta has two excellent Sichuan restaurants? It just helps that Gu’s is a little closer to Buckhead. Very nice review. I think the service at Tasty China 2 is a dealbreaker though.